Dec. 2, 2017 10:00 p.m. The fact they won a provincial banner should not have come as a surprise to the Langley Christian Lightning. Yet there they were, in a little state of disbelief. 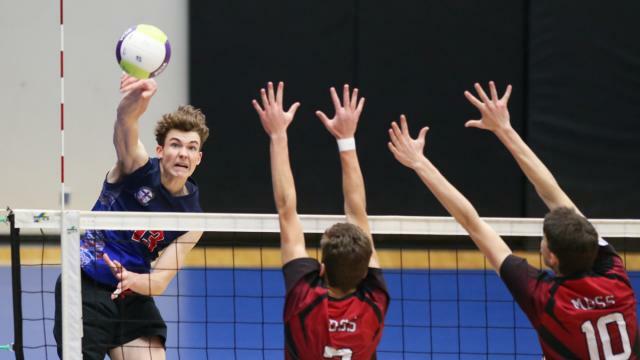 The Lightning senior boys volleyball team had just dispatched their Fraser Valley rivals, the Abbotsford Christian Knights 3-0 in the gold-medal game of the BC boys AA volleyball championships on Saturday night at the Langley Events Centre. The Lightning were the top seed heading into the championships and the defending gold medallists as well. But this team — especially the core of its eight Grade 12s — knows how to win, having also won gold at the junior boys level two years ago. The Lightning won the first two sets relatively easily, 25-17 and 25-15. The third set was back-and-forth but Langley Christian prevailed 25-22. It capped off a perfect four days for the team. Langley Christian was 3-0 to win their pool on Wednesday and then they beat Smithers and MEI on Thursday, in the round of 16 and quarter-finals, respectively. The Lightning would then take down Duchess Park 3-1 in the semifinals. Prior to Saturday’s final, Hofer said her message was simple. This was the fifth time in six tries the Lightning beat the Knights. But the Knights featured seven Grade 11s of their dozen players. Abbotsford Christian went 1-2 in pool play and then beat Sa-Hali in the round of 16 and Prince Charles in the quarter-finals. They then knocked off College Heights in the semifinals to set up one more showdown with their Fraser Valley rivals. “That was our goal, to make provincials and then make finals at provincials,” said coach Anthony Janzen. The Knights came out tentative in the first two sets. But in the end, the Lighting — and especially most valuable player Brodie Hofer — were too much. Hofer, who was forced to start the season on the bench as he recovered from a pair of broken toes, was more concerned about the banners then he was with his individual accolades. “(Those awards are) nice but having three banners with guys I have been going to school with every day, that I see all the time and are my best friends, coming home with those, tops my MVP awards,” said the graduating senior who will play at the LEC as part of the Trinity Western Spartans volleyball team. He also said the team was able to feed off the crowd at the LEC. The players know the had something special with this Lightning group. “I was thinking about this afternoon — I am excited but I am also a little bit sad,” Dahl said. “After tonight, it’s over. In addition to Hofer and Dahl’s awards, Caleb Schnitzer was a first team all-star and Caleb Kastelein was a second team selection. Abby Christian’s Cameron Vanderveen and Cole Brandsma were also first team all-stars.